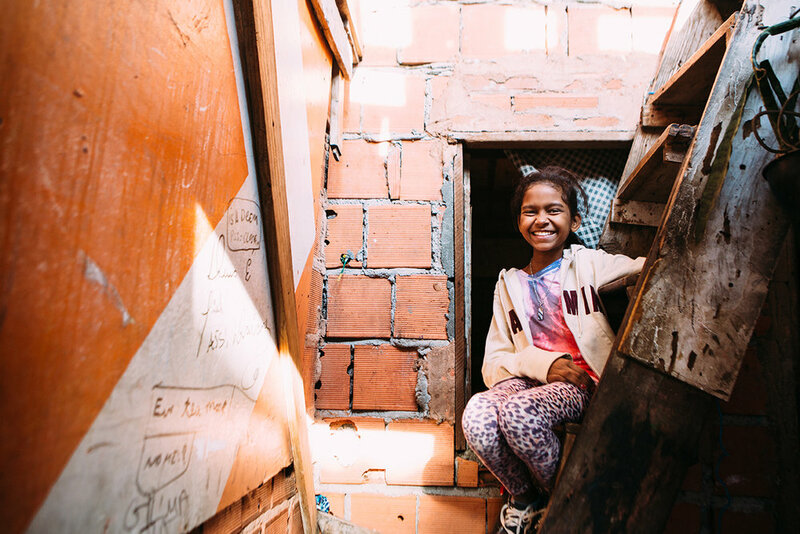 There’s a building among the skyscrapers and slums of São Paulo, Brazil where kids from the favelas come to escape the streets every day after school. Justin Bieber’s song “Sorry” float down the hallway of the community center, echoing off of the concrete walls and the team of ten photographers who have just arrived for the day can’t help but glance at each other and smile. Daiane is here. When the van doors close, it isn’t long before the little girl who stole our hearts two weeks ago is running around the corner to greet us in rapid Portuguese, playing “Sorry” from someone’s phone. She is small for her age. At twelve she is only about four feet tall, but it is quickly apparent that her proportions are different than other kids’. Her torso is short, but her legs are long. Her thighs are as thin as her upper arms. And as she skips and twirls around her friends, the extreme curve of her back stands as a visual reminder that her time is short. Daiane suffers from scoliosis so severe that her ribs are crushing her heart and lungs. In just two years of developing scoliosis, Daiane’s life has transformed from one of running and playing sports, to one of limited movement and chronic pain. Despite her deteriorating quality of life, Daiane’s smile is unending. Her joy is consistent. Her dancing is continuous. And the more we got to know Daiane the more we fell in love with her spirit and her dreams; her dreams of learning English, becoming a professional dancer and teaching ballet and hip hop. While Daiane's joy is contagious, it doesn’t reflect the reality she lives. Her mother is unemployed, her father isn't in the picture, and she lives in a Brazilian slum. Her house is simple, made of plywood, and when it's cold outside her bones ache so she often sleeps with her sisters or mother to stay warm. Her definition of home is something any of us would struggle to understand. And yet, there she was every day with that grin from ear to ear. 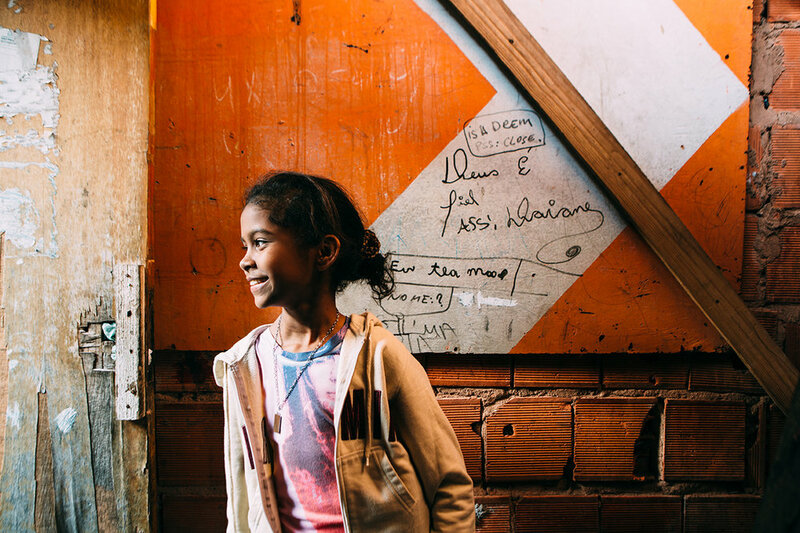 Daiane is currently on a list to receive free surgery from the public health system in Brazil, but that waiting period could be up to seven years, but Daiane does not have that long. She has already been blessed by a surgeon who has offered to the do the surgery for free, but she is still in need of the equipment to straighten her spine, the hospital stay, and follow ups to check on her health. All of these expenses combined will equal approximately $100,000 USD. For her and her family, that number is impossible. They can't afford the surgery that will save her life. But we believe in the power of community, of people who care, and this little girl who deserves a fighting chance at her dreams. We believe that Daiane's story is powerful. She moves you. She reminds you that life is not defined by circumstances. It's defined by our reaction to them. And our reaction to Daiane is to fight for her. If you feel moved or wish to join us in the campaign for Daiane's life, please donate here.